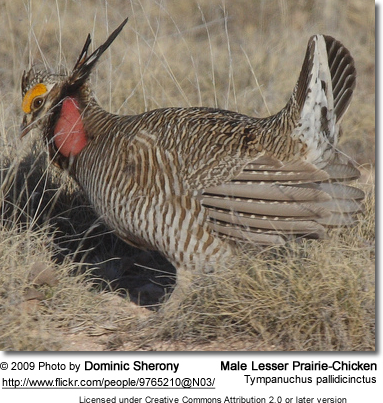 The Lesser Prairie Chicken, Tympanuchus pallidicinctus, is slightly smaller and paler than its near relative the Greater Prairie Chicken. It is found primarily in the sandhills and prairies of Western Oklahoma, the Texas Panhandle, and the Llano Estacado of Texas and Eastern New Mexico, and also rarely in Southeastern Colorado and Western Kansas. Like its larger relative, it is known for its lekking behavior. Considered "vulnerable" by the IUCN due to its restricted and patchy range, it is vulnerable to habitat destruction. There is evidence suggesting that global warming may have a particularly detrimental influence by greatly reducing the size of the sagebrush ecosystem. Subfossil remains are known e.g. from Rocky Arroyo in the Guadalupe Mountains, outside the species' current range but where more habitat existed in the less humid conditions in the outgoing last ice age. They disappeared apparently no later than about 8000 BC, soon after the start of human settlement, which may also have contributed to the local extinction.